WATER!! WATER!! WATER!!! Sandollar condo at Crescent Beach # 203 Bldg. 2 2nd floor with elevator .No other condo in St. Augustine Beach has the view from every room in condo of water!!! WATCH THE VIDEO TOUR WATCH THE VIDEO TOUR PHOTO IN THE TOP SCROLL OF PICS TO WATCH A TOUR OF MY CONDO THIS IS NOT SHOWN ANYWHERE ELSE THAT SAYS WATCH VIDEO, CLICK ON THE U-TUBE TOUR. 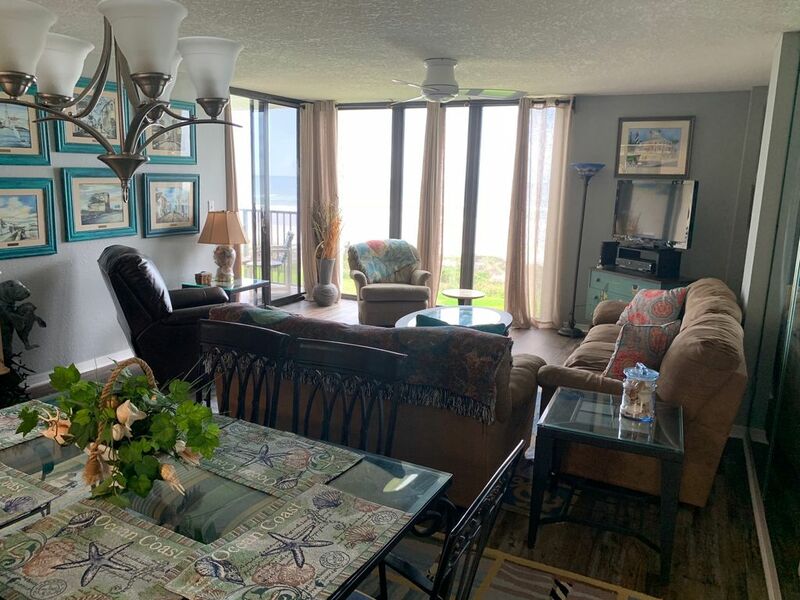 Back bedrooms over look this second floor condo with inter-coastal waterway views and the master and living room looking directly at the ocean, DIRECT OCEAN FRONT!!! very few condos have this view from their condo!!! located just ten minutes south of St. Augustine, this condo is situated on Crescent Beach, it's like having your own private white sand beach. The Inter-coastal Waterway is at the back door to enjoy the river fishing and boating, all the comforts of home, New Kitchen installed Jan 2016 Granite counter tops , New Stainless Steel Appliances installed last year , condo has baby Furniture which includes a pack and play , high chair , 2 strollers Booster chair. 1550 square feet of living space, three large bedrooms, two full baths, and a full utility room with washer, dryer . Condo features four Flat screen TVs and DVD VCR players and wireless DSL hookup. Beach Chairs and Beach towels are in unit . This Unit is a flat 2nd floor condo Unit 203 bldg 11, no stairs to walk, Pets Not Allowed and No Smoking in unit. Beach chairs , Beach umbrella , beach buggy & Beach towels also in condo provided. Shopping buggy's and flat carts are on site to carry your things to condo NO LUGGING UP ELEVATOR!!! Watch the great sunrise and dolphins swim by from your front window. The master bedroom doors and living room doors open onto a balcony allowing you to enjoy the ocean breeze and watch the beach below you. The Sandollar II Complex on Crescent Beach offers any family the best vacation St. Augustine can offer. With only 40 units in this building, mostly owner owned, the pool and tennis courts are not crowded. It has an elevator and covered parking. Boat parking is available along with a boat ramp 1/2 half mile from the condo, no boat or trailer parking on site . Golf World Village is 20 minutes. Golfing is nearby. Fish from the Getty one mile from your front door. Private boardwalks lead to the non-crowded beach we enjoy year round. The condo is just two hours from Orlando and all the area attractions, one hour from Daytona Beach, and one hour from Jacksonville Airport. * SPECIAL RATE check for last minute available dates . * WEEKLY RENTALS: Are due paid in full 30 Days prior to check-in. Under 30 day booking date all are paid at time of booking. (Monthly see below on monthly rentals). *Weekly- First Payment /Deposit of 25% along with CSA traveler insurance of 59.00 for 1500.00 of damage protection is due at booking see book it for details . All other fees at time of booking are Homeaway fees due to VRBO. * No Booking is confirmed until Payment Deposit is received and the written rental contract is signed and returned. * ALL WEEK rentals there's a 125.00 processing cancellation fee . If under 60 days of the rental date there's a 25% cancellation fee of rental total . ________________________________________________________________*MONTHLY RENTALS : 1st payment -there's Is a 25% rental Payment/Deposit due at booking time to hold the unit . 2nd payment is due to be made 150 days before check in date . 3rd /final payment is due 60 days before arrival date . There is a 25% processing and cancellation fee on all monthly rentals. No refund of 1st Deposit payment will be given less then 150 days prior to check in date . *ALL NAMED STORMS within the direct area of a storm cancellation will be exchanged at no charge on another date within the same weekly rental value or a difference can be paid for the weekly rate of the new time period, and only if a named storm causes evacuation directly to our Crescent Beach Area, only then a exchange date will be worked out on availability. I am a Business owner that lives in East Palatka, Florida 30 miles from property because this is my 2nd home I want my visters to feel they are at home also I love coming over and staying everychance I can at Sanddollar. I am a hands on owner and always only a phone call away not a faceless rental company. Crescent Beach has prettiest white sand beach in all of Florida. Close to downtown old St. Augustine shops, restaurants, and local attractions. Family oriented area with lots to do and great places to eat and have fun. Wireless DSL Service is available. everything you could want to cook with, cofee pot ,grille, blender, tooster oven, ice maker fully stocked kitchen. My unit is a flat unit ,with a elevator but stairs would have to be used in case a elevator power went down ,the bath room doors would be a tight fit for a wheel chair ,also shower only has a step up into shower. It would be the renters responsibility if a wheel chair usage was needed in use of this condo.